The recruitment industry is sometimes accused of lacking substance, with some recruiters seemingly more interested in sales targets than delivering any real value. Brightsparks on the hand have focussed on people; building a strong network of people and businesses to deliver value as well as profit. With a community of over 45,000 and having employed over 14,000 people themselves — they understand the importance of placing the right talent with the right opportunities. I worked in partnership with founder James Herbert and marketing agency Thomond to evolve the brand narrative and visual identity to better reflect the business both now for the future. When we think about our working life, we're basically looking at a huge percentage of our time on earth. Not a pleasant reality check for anyone who isn't feeling fulfilled at work. With that in mind, the recruiters role suddenly takes on much greater importance; not only to get people a job, but potentially alter the course of a persons lifetime is kind of a big deal. Likewise, people are the beating heart of all organisations; good people working together will make a real difference to output and ultimately the bottom-line. We agreed we didn't just want to talk recruitment, but the opportunity was to demonstrate how our understanding of people on an emotional level, has enabled us to grow our strong network of candidates that can make the difference to a business. Previously, the visual identity had been bright and playful and we wanted to retain that energy, but it lacked the confidence and forward thinking nature of the business. 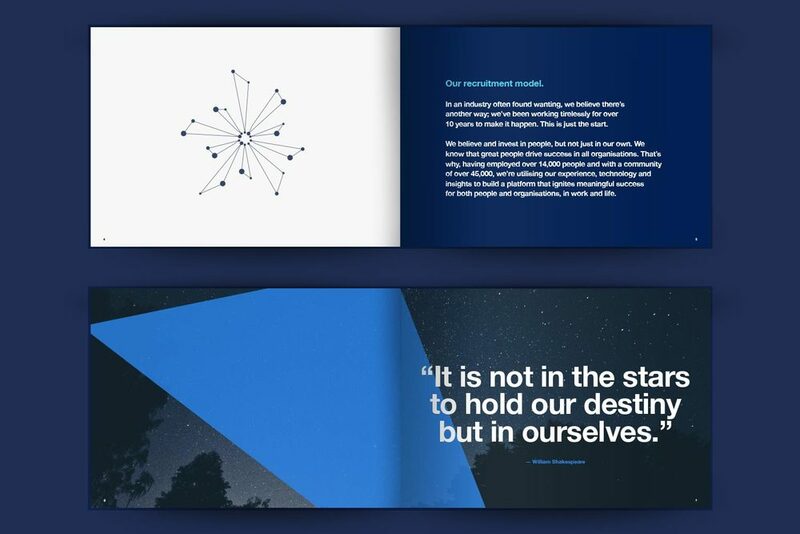 We developed a bright and bold visual system that represented each individual in our network whilst highlighting the combined strength of our community.